We’d love your help. Let us know what’s wrong with this preview of Broadland by David Blake. When a girl’s body is found strangled, raped, and horrifically mutilated by a boat’s propeller, deep in the heart of the Norfolk Broads, newly arrived Detective Inspector John Tanner is as THE DEBUT CRIME THRILLER OF THE YEAR! To ask other readers questions about Broadland, please sign up. Tanner I really liked. He is a man with a past, of which the author doesn’t reveal to much, leaving, I hope more to come. The glimpses we do get Having been lucky enough to have had a couple of holidays on the Norfolk Broads, one of which was spent on a boat, I knew a lot of the places that were mentioned throughout the novel which really made it come alive. Whilst you get a feel for how picturesque the area is, you also get to see a lot of a darker side through the crimes committed in the story. Oh wow, what a terrific start of a new series. As soon as I opened the book, I was lost, lost in the story. Unfortunately, one has to sleep from time to time. If not I would have devoured the book in one go. I loved DI Tanner and the banter between him and Jenny. It was very interesting to get a peek in the DI’s past which gave us a better impression of the person behind the police officer. I enjoyed the story a lot and this was also due to the author’s fluent writing style. The author managed to c Oh wow, what a terrific start of a new series. As soon as I opened the book, I was lost, lost in the story. Unfortunately, one has to sleep from time to time. If not I would have devoured the book in one go. I can’t wait to read the next part. This one deserves the full 5 stars. Thank you, David Blake and Book On The Bright Side Publicity & Promo. I am a big fan of this author's comedy space series so I was very intrigued when I heard that he had "gone all serious" for this, the beginning of his police procedural crime series, set in the Norfolk Broads. Would he really be able to put all the bonkers, irreverent humour behind him and set his mind to something a little more serious? And... the verdict is... yes he blooming well can! Although it did hold echos of his trademark humour in some of the dialogue between the two main characters, bu I am a big fan of this author's comedy space series so I was very intrigued when I heard that he had "gone all serious" for this, the beginning of his police procedural crime series, set in the Norfolk Broads. Would he really be able to put all the bonkers, irreverent humour behind him and set his mind to something a little more serious? And... the verdict is... yes he blooming well can! Although it did hold echos of his trademark humour in some of the dialogue between the two main characters, but nothing on the scale of Capstan and Dewbush! So, for all you who didn't quite gel with these books, and are not sure whether to take a punt on this series, have no fear, they are nothing the same! Jane Richardson is missing. Daughter of a prominent local millionaire, could it be money related? Could it be kidnap? New boy to the team, just transferred in, DI John Tanner is teamed up with born-and-bred DC Jenny Evans to investigate. Then Jane's body turns up and fingers start to point at the husband. But he was, well, he was pretty well occupied at the time. Or was he? Tanner and Evans continue with their investigations, alongside other officers and it soon becomes evident that this is going to be a tricky one to solve. As with all new series, there is quite a bit scene setting and character development to be found in this book. Nothing more than the average series opener, and it doesn't distract from the main plot. Personally, I can do without all the boaty stuff but as the setting is quite important to both the series and the crimes being investigated, and also spoke to character development, I was happy to accept their inclusion. Yes, there are a few cliches to be found herein. The wounded cop with a dark past, a colleague who is less than welcoming and a sidekick that, well, you'll discover that when you read the book. But, that formula generally works, and this book is no exception to that. The crimes in the book are well plotted and the investigation flows along nicely, with twists and turns aplenty, along with the usual secrets, lies and duplicitous behaviour. Yes, I did think they were a bit slow on the uptake regarding one key thing that I saw a mile off, and I did spend a bit shouting at them to see it too but they did get there in the end! The characters were all well described and I took to the majority right from the off as I found them all easy to connect to. Interaction and banter between them was also spot on for me and made them feel more real. So much so that, when things transpired towards the end, I was literally reading with my heart in my mouth as the book reached its rather shocking conclusion. Whoa the opening was one that really made me sit up, take notice and raise my heart rate like that of Jane Richardson as she is faced with a choice, one similar to the one I had to make late at night after work too. Should she take the short cut home, a much darker and deserted way that cut precious minutes from an already very long day or walk the safe but long way home? Believe me it isn’t common sense that makes the choice, it is your feet after a 14 hour shift. Her feet won and my nightmare Whoa the opening was one that really made me sit up, take notice and raise my heart rate like that of Jane Richardson as she is faced with a choice, one similar to the one I had to make late at night after work too. Should she take the short cut home, a much darker and deserted way that cut precious minutes from an already very long day or walk the safe but long way home? Believe me it isn’t common sense that makes the choice, it is your feet after a 14 hour shift. Her feet won and my nightmare became her reality. A very dark and twisted story of murder most foul in the beautiful settings of the Norfolk Broads, with twist and turns gripping you from the outset with horror that sets those hairs tingling. Everytime I guessed or made an assumption about what was going to happen next, I was pretty much wrong on every count. You will be gripped until the very last page as you learn about DI Tanner, where he originates from and what floats his boat (excuse the pun). Other chararcters also show their colours and A very dark and twisted story of murder most foul in the beautiful settings of the Norfolk Broads, with twist and turns gripping you from the outset with horror that sets those hairs tingling. Everytime I guessed or made an assumption about what was going to happen next, I was pretty much wrong on every count. You will be gripped until the very last page as you learn about DI Tanner, where he originates from and what floats his boat (excuse the pun). Other chararcters also show their colours and where their allegances lay creating a rich tapestry of intrigue, I was in near tears when I was unsure about a couple of characters and would they survive, obviously some do and some don't. Just don't go getting too attached as it could be them that fail to make it. Detective Inspector John Tanner has just moved to the Norfolk Broads after a bereavement in London. On arriving at his new job, I think it’s fair to say, he’s not particularly welcomed! So much for thinking he might have a quiet life here, he’s assigned to Missing Persons. But his first missing person turns into a murder! Then one murder tu Wow! I absolutely loved this book! This was one of those where you really don’t want to go to sleep at night, but you know you have to as it’s a school night! David first came to my attention a couple of years ago when I first read book 1 in his Inspector Capstan series, The Slaughtered Virgin of Zenopolis and have read every book he has published since. This book however is completely different to his Inspector Capstan, Abigail Love and Space Patrol books, as it is a serious Police procedural book instead of the comedy of his other series. I was very intrigued to see how this worked and I am very to pleased to confirm that David is as brilliant a serio David first came to my attention a couple of years ago when I first read book 1 in his Inspector Capstan series, The Slaughtered Virgin of Zenopolis and have read every book he has published since. I was very intrigued to see how this worked and I am very to pleased to confirm that David is as brilliant a serious writer as he is a comedy one and I am very pleased he managed to pull this off. As this is the first book in the series we learn all about the main characters early on and the scene setting can take a bit of time but it was all worth it as it made the story flow much better later on and visualising everything was easier when I knew what people looked like and the lay of the land. The story line flows really well and had me guessing all the way through. At times the book does seem to be very by the book in a police procedural process but it works really well and there are some very nice and unique twists throughout. I guessed a couple of bits but still ended up seconding guessing myself afterwards. People who are familiar with the author, David Blake, who has produced numbers of comic crime mystery books surrounding the characters of Inspector Capstan and his sidekick Dewbush - in both present day and futuristic environment - will know what a great author he is. Well, this is the same author (that is, not another with the same name) and he has now strayed from his 'usual' comic writing style and written a serious crime mystery. Has he done a good job in this cross-over? Yes, he's done a ver People who are familiar with the author, David Blake, who has produced numbers of comic crime mystery books surrounding the characters of Inspector Capstan and his sidekick Dewbush - in both present day and futuristic environment - will know what a great author he is. Well, this is the same author (that is, not another with the same name) and he has now strayed from his 'usual' comic writing style and written a serious crime mystery. Has he done a good job in this cross-over? Yes, he's done a very good job. This book is the start of a new series, set in the Norfolk Broad (East coast of England) with the main characters being DI Tanner and DC Evans. The story has all you need to keep you engrossed in the book - mystery, touch of humour, and touch of romance between the two characters. I'm not going to go any further into the story because the blurb says enough. However, I will tell you it's a great read. I feel like I've come upon an episode of the Keystone Cops. He and his subordinate DC Jenny have an immediate attraction to one another. How cliché. Jenny was sizing Tanner up for boyfriend material before they even got to the car to take them to interview the husband of the missing woman. It made her look really bad, as though that were her aim rather than being a good and competent policewoman. There is far too much dithering and detail given in the book. It detracted from the storyline and made the book move very slowly. By the time I got through half of the book, I found I really didn't care who murdered the woman – or about any of the characters either. I enjoyed David Blake's writing and got through this book a lot faster than I thought I would. It was easy to get into and I found myself turning page after page without realizing just how far into it I'd gotten. The story flowed well, with a few twists and turns that I did not see coming (which is always going to be a good thing.). Broadland is slated as the first of a series of books, and as such it includes more scene setting and character backstory than some people would like. Personally I s I enjoyed David Blake's writing and got through this book a lot faster than I thought I would. It was easy to get into and I found myself turning page after page without realizing just how far into it I'd gotten. The story flowed well, with a few twists and turns that I did not see coming (which is always going to be a good thing.). Broadland is slated as the first of a series of books, and as such it includes more scene setting and character backstory than some people would like. Personally I see it as laying a foundation to be built upon and didn't mind it at all and am looking forward to reading the next in the series. I’ve always enjoyed reading David Blake’s comedy books full of British slapstick. This is a turn to the serious DCI Tanner has relocated from London to the Norfolk broads to get away from bad memories of his daughters murder. He is new to the area and is treated as such by his contemporaries which he takes on the chin. He is assigned to missing persons with DC Evans. He strikes up a good working relationship and possibly more as they investigate a missing woman. The story moves along well, I want to I’ve always enjoyed reading David Blake’s comedy books full of British slapstick. The story moves along well, I want to let you know it’s highly entertaining but don’t want to give any plot spoilers, there’s great chemistry between the main characters and although some of the plot is easy to gauge there are some nice twists. This is the first book I’ve read by this author. The main characters in the book are brilliant, I loved DI Tanner and his relationship with DC Evans. (I’m a sucker for a book with good character relationships and this did not disappoint). 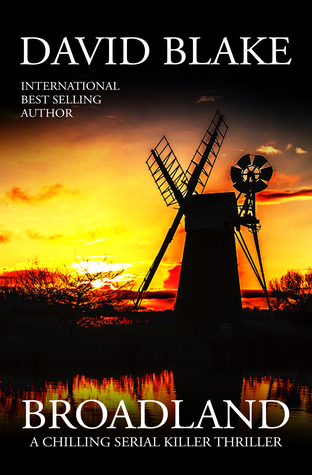 The book itself is set on the Broads- which it made into a dark and twisted setting. What really struck me with Tanner was how murder seems to have marked him as a man. I really enjoyed this book, the story was fast paced with short enough chapters to make me want to keep turning the pages. The twists and turns in the story kept me guessing and I enjoyed the characters which I felt were very believable and I could empathise with. I would recommend this author and book if anyone likes a fast paced crime. story you can get your teeth into! I thought this was a really good start to a new detective series. I loved the setting especially as living on a boat on the river is one of those dreams that I would love so this book has just made me want this dream even more. I really invested in Tanner and Evans and look froward to traveling along with them on their next adventure. First in a new series set in the Norfolk Broads. I enjoyed the characters, and DI Tanner’s growing relationship with his new colleagues after his transfer from London. It’s a good puzzle and several times I thought I’d sorted who was guilty – but things aren’t as simple as I believed them to be. This has all the signs of being a very enjoyable new series. Certainly this first volume is. Reading the story, it was easy to imagine you were there! Once started it was impossible to stop reading. When finished, it was difficult to start reading another story. Roll on Book 2! First encounter with DI John Tanner and DC Jenny Evans Congratulations to David Blake a great story, great locations, great partnership look forward to it blossoming professionally and in their personal lives. Looking forward to more from them in St Benet’s. My first dance with this author, in a setting that is new to me. The Norfolk Broads. A well written, fast moving tale that I really enjoyed. Four stars from me. More on the blog tour. David Blake has transitioned from slapstick comedy to crime drama and it works well. The plot moves along at a good pace and the main characters are likeable with good chemistry. Awaiting book 2 now to see this progress. No plot spoilers just read and have fun! A highly entertaining murder mystery set in the Norfolk Broads. The story is full of twists and turns but is easy to follow, which meant I just kept turning the pages. I particularly liked the banter between the characters which lightened the overall mood of the book but there were darker moments too, which balanced the whole story beautifully. A cracking start to a new series by David Blake and I look forward to reading more about Tanner & Evans in the future. Thank you to TBC Reviewer Requ A highly entertaining murder mystery set in the Norfolk Broads. Thank you to TBC Reviewer Request Group for the ARC. A thoroughly enjoyable read. I could not help but compare the characters and situations found here with the tv series “Midsomer Murders”. The writing and plot development was skillful and smooth. I will look for future books in the series. Well done! When a girl’s body is found horrifically mutilated by a boat’s propeller, deep in the heart of the Norfolk Broads, newly arrived Detective Inspector John Tanner is asked to assist with the investigation.